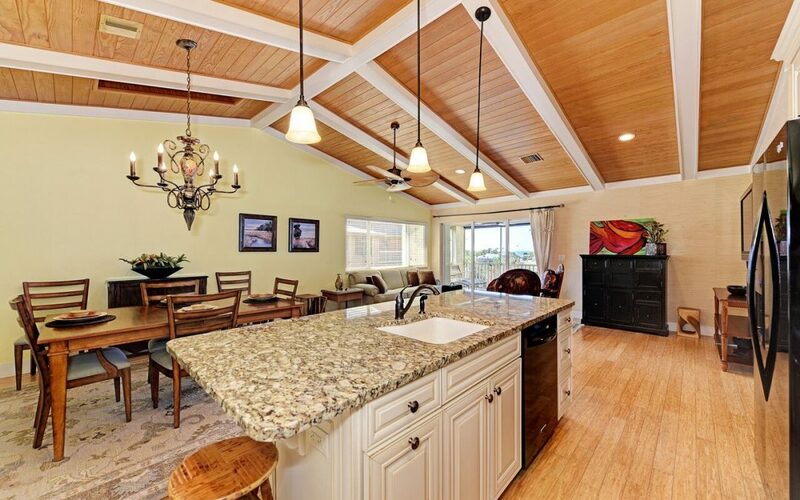 Owners of this beautifully updated Nokomis intercoastal condo are anxious to sell! This condo is like new, with over $100,000 in upgrades and ready for its new owner! Nicknamed “The Marina,” this Nokomis Bayshore Club property consists of 10 total properties, 7 on the water side and 3 on the road side. Located directly on the intercoastal waterway, a short walk to Nokomis Beach and even shorter jaunt to Pelican Alley and Pop’s Tropigrille restaurants, you can go fishing on one of the piers or watch the Gulf’s spectacular sunsets from your screened and covered lanai that also offers expansive views overlooking the heated pool, and Gulf of Mexico off in the distance. This rarely available end unit penthouse on the 3rd floor offers both cathedral ceilings and additional windows to bring in that FL sunshine. The 2-car under building carport has room to keep kayaks or other toys as well as a large storage unitl! The concrete block-built complex has withstood over 100mph winds and no damage during hurricane season. Newer plumbing within the last 10 years. AC new in ’07. The HOA just replaced all roofs last month and the exterior has been painted! t from Sears}. Quality finishes throughout in this split plan layout, which offers privacy for both owners and guests. A monthly rental is allowed with restrictions. Priced under appraised value, this unit is not one to be missed.